SafetyMaster SM450 3.4m x 50mm Belt Barrier | Order Today! The SafetyMaster is the value arm of the SafetyPro range of belt barriers. Offered in vibrant colours with contrasting belts that make them ideal for use in commercial environments. When placed around a work area the Safetymaster makes an ideal solution for keeping people away from working machinery. When placed across an aisle in a warehouse the SafetyMaster can be used to keep workers away from moving forklifts. Areas of wet flooring can be cordoned off during cleaning to prevent access, reducing slipping or trip risks. All of the SafetyMaster Range is weatherproofed. 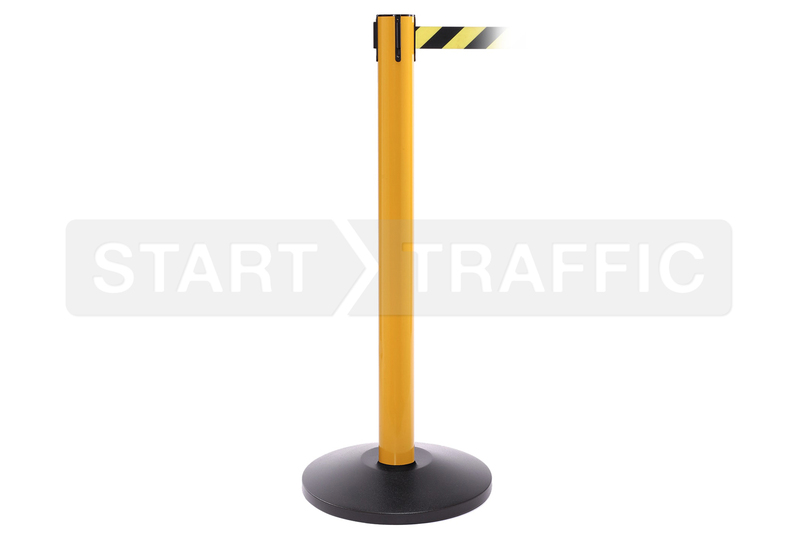 Brightly Coloured Post Options - Ensure that the posts and belts are seen easily by both workers on foot or those driving forklifts. Floor Protection Ring - Prevents scuffing of flooring when being moved. A full rubber ring surrounds the entire circumference of the foot. Locking Universal Belt Clip - The clip that attaches to the next post in a chain features a locking toggle, this prevents accidental unlocks. The clip is also of a "universal" design, allowing it to connect to all popular brands of posts. Belt Braking System - A slow retraction system prevents the belt from drawing back into the post quickly in a "whipping" action. This is a single belt ideal for use in factories and warehouses. The belt is just above waist height. The twin model features two belts, one at knee level and one just above waist level. The extra belt offers increased visibility and security for passers-by. Are you looking for something heavier duty? The SafetyPro line may be just what you need! Do You Want to Customise Your SafetyMaster? The options shown above are not the only options available, if you need custom colours, printing or any other items give us a call! Our sales team will be happy to help you find the right belt barrier to suit your application. They can be contacted during office hours on 01905 794 875.